Alan Alda has 2 media appearances. DIESEL, A Bookstore is proud to say that former M*A*S*H star, Alan Alda, will be kicking off our event series at the new Brentwood store!! He'll be joining us to share more from his bestselling memoir, THINGS I OVERHEARD WHILE TALKING TO MYSELF, a book that is candid, wise, and as questioning as it is inclusive. In it, Alda amuses and moves readers with his unique and hilarious meditations on questions great and small. Things I Overheard While Talking to Myself is another superb Alan Alda performance, as inspiring and entertaining as the man himself. 2006 honors include his 32nd Emmy nomination and winning his sixth Emmy (!) for his appearance on West Wing (Best Supporting Actor in a Drama Series) as well as the National Science Board’s Public Service Award, and his induction into the American Academy of Arts and Sciences. He has earned international recognition as an actor, writer and director. In addition to The Aviator, films include Crimes and Misdemeanors, Everyone Says I Love You, Flirting With Disaster, Manhattan Murder Mystery, And The Band Played On, Same Time, Next Year and California Suite, as well as The Seduction of Joe Tynan, which he wrote, and also The Four Seasons, Sweet Liberty, A New Life, and Betsy’s Wedding, all of which he wrote and directed. ~ Mr. Alda will only sign copies of his books. ~ No posed photos; however, photos from the signing line are okay. ** Please note that this event will take place in the outdoor courtyard of the new DIESEL, A Bookstore in Brentwood, located at 225 W. 26th St., Santa Monica, CA 90402. Alda adopted his surname by combining ALphonso and D'Abruzzo. Alan Alda is currently considered a "single author." If one or more works are by a distinct, homonymous authors, go ahead and split the author. 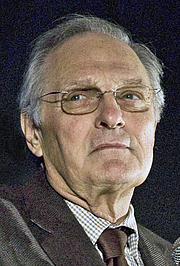 Alan Alda is composed of 3 names. You can examine and separate out names.